Think better, Move better and Eat better at work!" 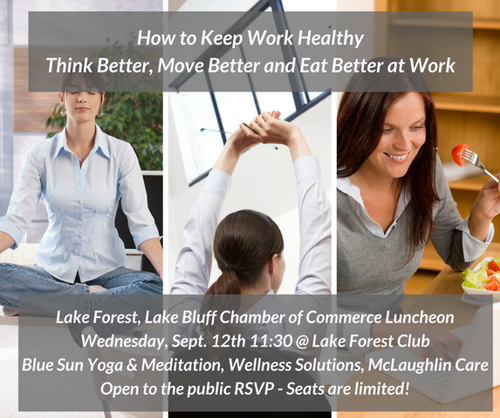 Join us for the Lake Forest Lake Bluff Chamber wellness luncheon Wednesday September 12 at 11:30 at The Lake Forest Club. Open to the public--bring your friends and co-workers to hear three amazing speakers. Blue Sun Yoga and Meditation, Wellness Solutions physical therapy and McLaughlin Care will give you our best tips to make your work day rock your health!